—LinkedIn, Digg, Flickr, Facebook, Imeem, and AIM Pages are all growing more than 100 percent year-over-year. —Wordpress is also on a tear, gaining 1.6 million unique visitors from the previous month alone, more than Six Apart’s one-month gain of 800,000, but still behind Blogger’s 3.9 million (see last month’s post for comparable numbers). 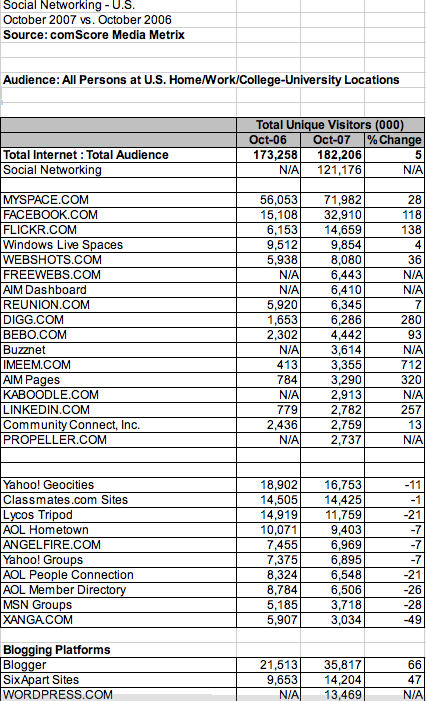 —AOL’s Propeller (its Digg clone) is doing better than expected, with almost the same number of visitors as LinkedIn.